plumpudding: Pizza sauce. Who needs it? Pizza sauce. Who needs it? We enjoy pizza in this house. We'll eat any variety, really-homemade (always best, of course), Sam's Club, Little Caesar's, frozen, Giordano's, pita pizzas, whatever. Today for lunch, I pulled just a few items from the fridge and made this one. I didn't have any pizza sauce prepared and was completely out of canned tomato products, so I made a version of this Quick Pizza Margherita from Cooking Light. I don't usually have store bought crusts around, but after enjoying this super fast lunch, I may be inclined to buy them more often. 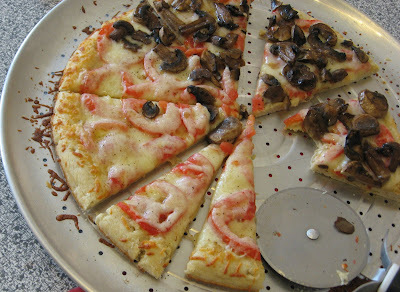 For our Pizza Margherita, I used the store bought crust, olive oil, 2 plum tomatoes, some shredded mozzarella, and mushrooms. Plus, a bit of balsamic vinegar, salt, and pepper. Yum. Two more of my favorite Cooking Light pizzas are the Caramelized Onion and Goat Cheese Pizza and the Malaysian Chicken Pizza. These have all been enjoyed repeatedly in this home. Those pizzas are all delicious! I want some now. I agree! My favorite pizza is pizza bianco and another one with carmalized onions, figs, and proscuitto. Your pizza looks yummy! I adore all the crafts you do. Yummy pizzas! When I dont' have any tomato sauce, I use some pesto as the base - delicious! Since we can't buy pizza crust, I like to make pizza crust in the bread machine (because it's a little less work) and then freeze what I don't need to quickly use for later. We also like to do personal pizzas and I can make about 6 personal sizes with one batch. I'll just roll what I don't need in balls, wrap in plastic wrap and freeze. After I thaw I'll make into pizza. I also love this size from Cooking Light http://find.myrecipes.com/recipes/recipefinder.dyn?action=displayRecipe&recipe_id=223183&package_id=1038857 We'll definitely have to try the pizzas you talked about! We've made and loved all three of those CL pizza recipes! Try the Artisan Bread in 5 Minutes a Day book. Their master recipe keeps in the frig for 2 weeks and makes an amazing quick pizza. Just grab a handful of dough, roll it out, throw some toppings on while your oven is preheating to 550 (!) and it cooks in 9 minutes and tastes amazing.